I was listening to A Splendid Table on NPR while driving between farm and farmers market a couple of Saturdays ago and heard Mario Batali expounding on gelato made from really, really ripe fruit. This was for me, so I thought, given the really, really ripe plums on my table that were going to be a fruit fly feast if not used up. That was, until I realized the amount of eggs that would be included in such an affair. I was going along with it for a while, since the concoction used milk instead of cream. Full stop. Fast left, back to the old sorbet technique for us. I had in mind a fruitful bold expression, and once the creamy egg-loaded gelato was off the table, I turned to spices, in this case ginger and cardamom. I’m always mindful of the icy factor in sorbets, but plums have a pretty good consistency by themselves. Our plums were so ripe as to be watery so I had to compensate. The trick was simple syrup (water and sugar in equal amounts) steeped with fresh ginger and a pod’s worth of black cardamom seeds. 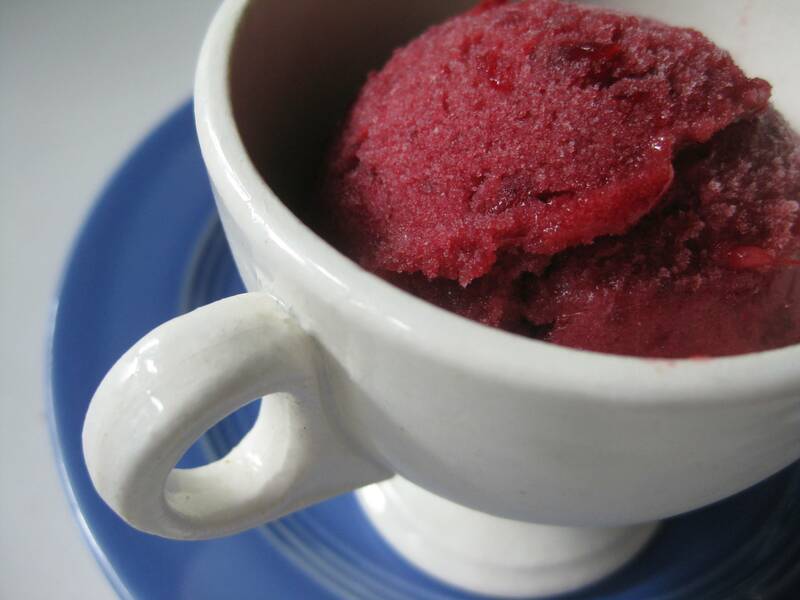 The combination of the deep flavored plums and the perky, even challenging depth of the spices made for a great sorbet, another keeper of a recipe. Clean the plums and set aside. Make the spiced simple syrup by combining the rest of the ingredients in a saucepan. Bring to a boil and then simmer for 5 minutes. Cool. Remove the cardamom seeds. Pit the plums, remove the flesh and place the flesh into a food processor. Pour the syrup into the food processor with the plums and pulse until smooth. Refrigerate until thoroughly chilled and process in an ice cream maker according to the manufacturer’s suggestions. Makes about 1 quart. Three of my favorite things and it never occurred to me to figure a way to put them together. Thank you for doing so!